This is a really easy project. 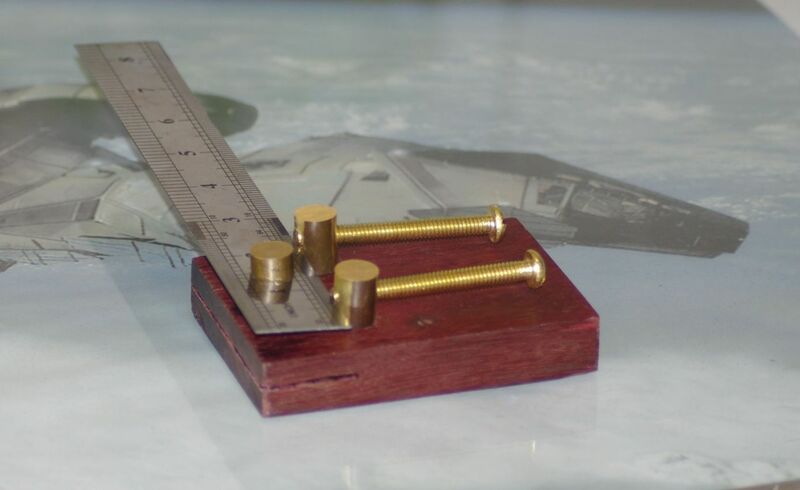 Needed Parts: 1 block of wood, 1 ruler, 3″ or so of 1/2″ Brass Rod, two long screws. Needed Tools: A tap and bit to match the two screws. I used a 1/4-20, Something to cut wood and brass with, something to drill with, Several drill bits including a 1/2″ bit. A smooth cut file, something to sand and/or grind down brass with and a screwdriver. 1: Measure the block you are going to use with the rule you are going to use. Drill a 1/2″ hole in the rule for a pivot. The hole should be centered, half the width of the block plus about an eight of an inch from the end on the ruler, and half way across the ruler. Using that hole, mark the pivot hole in the wood, for the point of the brass dowel triangle. You want just a touch, about 1/8″, of the rule exposed on the end and side. Drill that hole. 2: Drill two 1/2″ holes for the other two brass dowels. They are placed where the side of the hole is right at the inside side of the rule. 3: Drill two holes big enough for the heads of the end screws and make them pass through the end and slightly past the big holes for the two brass dowels. 4: Drill a hole for tapping, through the side of a 1/2″ brass rod a bit more than half the thickness of the block from the end. Drill a second hole a bit more than the thickness of the block plus the thickness of the blade, further down the rod. 5: Tap the holes in the brass rod and then cut off three brass dowels, two of them with holes tapped in their center, and one without. Lightly file the cut edges so they will be safe to handle. 6: Cut a shallow notch in the unthreaded brass dowel using the file. This notch will be used to lock this dowel in place with the ruler. 7: Tap the two threaded brass dowels into their holes and secure them with the brass screws through the end holes. Do not thread the screws in deeply yet. 8: Cut the slit for the ruler. Stop cutting when the first brass filings come out. 9: Put the ruler in place and tap the unthreaded dowel into place with the notch toward the body of the square. Tighten the screws until the ruler is lightly secured. 10: Grind the brass down to the wood. Sand the entire surface wood and brass, even. At this point the project should be looking good! 11: Take another square and check for squareness. loosen a screw until you match. Then tightened the other screw and checked it again. 12: Put some sort of finish on it to preserve it, pop the grain, and make it purty. Not bad for drilling eight holes, tapping two of them and making four cuts. Seriously nothing to this one if you have a drill press, you don’t even have to be able to drill straight. I need to polish it smooth with a scraper and finish it, but it turned out nice enough. Here is the block of wood, five drill holes, two in the end, and a slit cut in it. The parts are easy enough too. No need for perfection, after you polish it down, it will look down right purty. The unthreaded brass dowel is the pivot point for the ruler. The two screws can lock the ruler in at exactly the right angle. The brass dowels can rotate a bit, this allows the screws to shift into proper alignment. While it may look a touch rustic, this is not by any means an inexpensive or common tool. This allows absolute precision. This can be taken apart, lapped to flat on the surface edges and then made square and stable. While it is a simple tool I can toss into a tool box, it is however also a top end and quite valuable tool. You might be able to get it’s match for $50 but it will not be RECALIBRATABLE. For about $220 you could get an even better one from The other side of the planet. Mmmm, I may have to make one and slap some brass on the sides. He does offer these for sale, so if you want perfection in form and function, go to his site, and send him an email. For many tasks, using such a square may be overkill. Reducing error from the very beginning of a project however is rarely overkill. I make mine because I really want fine tools, and I live on what amounts to a teachers salary without the time off during the summer. Additionally when I open a tool box filled with fine tools that I made, there is an automatic curiosity and even respect given, that has it’s own value. Also there is the tragic pride issue. An HF square with the name of a North-Central City and a China stamp, will never quite give me the same feel as a tool I made. Additionally, I am trying to learn fine woodworking. Tools are perfect for this. They use much less wood than a regular woodworking project would, and require fairly high precision. When a mistake is made, the materials ruined are much smaller. Strength and detail must be considered. When you consider the total weight of all the tools in a tool box, vs the weight of the wood to make a shelf, suddenly the materials cost does not seem as great. Carpenters tool are good and useful, solid and relatively inexpensive and probably precise enough for most work. I want more than that. Here is my favorite square, nothing to show off, it lacks extreme polish, but it is totally accurate and stable. It does however make me grin as it looks like a happy dog with a stick in his mouth!